I’m so sorry to report that I have to cancel tomorrow’s pre-ride to the Blessing of the Bikes. I’m dealing with a family emergency which is going to extend through tomorrow, and I don’t have an alternate to lead the ride. As of now, the Blessing is still on, weather permitting. You can watch the Blessing Facebook page for any weather related cancellation there. I apologize for the inconvenience. Please join us for a pre-ride enjoying some country roads as we make our way to the Blessing of the Bikes at Kil-Kare Raceway in Xenia May 20, 2018. This annual event combines great food, vendors, live music and what amounts to a Holy Water fight as clergy members bless and sprinkle Holy Water on the thousands of bikes in attendance. It’s a good time, even if you’re not of the faith! Meet us for an optional breakfast at Cracker Barrel in Middletown at 0800. If you’re not hungry, just be sure to be there by 0845 for the ride briefing prior to the 0900 kickstands up. The ride ends at the Blessing. You’re free to enjoy the event and leave at your leisure. Admission is $3 per person or $5 per couple. Plan to be there in time for kickstands up at 1030! Cancelled – Age of Steam Roundhouse Tour! Update 20180504 – due to overwhelming requests for tours, the Roundhouse is unable to accomodate our attendance at this event. We’ll reschedule at the next opportunity. 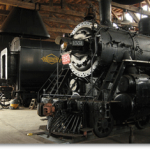 Plan to join us for a ride to Sugarcreek Ohio for an awesome tour of a WORKING steam railroad repair facility! The Age of Steam Roundhouse! The ride is about 220 miles each way and will be expressway for at least part of the ride, so you should be comfortable with expressway riding. Admission fee is $20 for the tour, tentatively scheduled at 2 pm. Meet at the Village Family Restaurant in Waynesville for breakfast at 0800 if desired. Ride briefing at 0845 and kickstands up at 0900. We’ll make at least one rest stop on the way for fuel and stretch. Lunch is TBD and will be in or near Sugarcreek. This post will be updated with more details as they become available! Undeterred by the early morning cold, two die hard Chapter 44 members met up for a tasty breakfast at the Village Restaurant in Waynesville before heading off for Portsmouth. After a quick stop in Chillicothe to pick up riders that didn’t show, they continued on to meet a lone rider from Chapter 309 at the wall. Following a tour of the wall, the group enjoyed a tasty lunch at the Portsmouth Brewing Company before parting ways for the ride back. It turned into a gorgeous day, and a good time was had by all. This is the planning page for the Jackson Kentucky Overnight lead by Mark Bamberger. This page will be updated with new details as they develop. 1200: Meet at Frisch’s Franklin for lunch and ride briefing.